A fascinating and fun-filled book of extraordinary facts about the oceans, seas and waterways of our world. The seas of our planet cover more than seventy percent of the Earth, but still remain shrouded in mystery. We know more about the surface of the Moon than we do about the lifeforms that have existed in the Earth’s oceans since long before humans became explorers of the deep. One such explorer is Blowfish, a marine biologist and star presenter of BBC Earth and ITV’s Fishing Impossible. In this entertaining and enlightening new book, he lifts the lid on a treasure chest of fascinating facts to reveal what lurks beneath the waves. From the invisible world of meiofauna living in the sands of our beaches to a cephalopod called the ‘Vampire Squid from Hell’ stalking the lightless depths, Blowfish takes us on an astonishing journey as he follows the tides and currents from shoreline to the bone-crushing pressure of the deep sea. 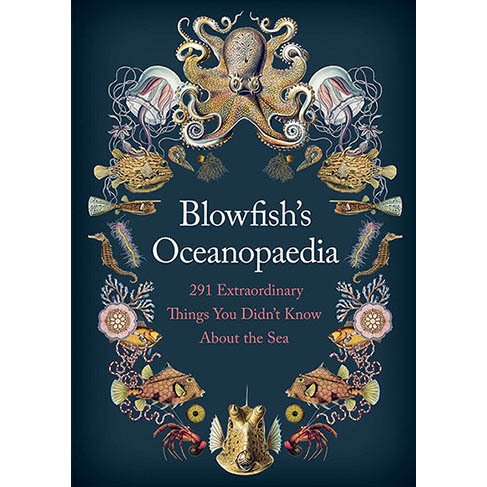 For the simply curious and the budding scientist alike, Blowfish’s Oceanopaediais a one-stop guide to all we know about our oceans and the weird and wonderful creatures that inhabit them.